Where are the devices e.g. DVD, Sky box etc? - If they are in the unit underneath how do they function using the remote controls? Think thinIn a narrow living space, choose slimline, non-fussy furniture. A blind with vertical stripes over the door and a skylight above help draw the eye up, increasing the feeling of height and making the room feel more airy. Narrow rooms In a very tight tunnel-shaped room, rather than breaking the space into multiple micro-zones, embrace the length and fit in one full-size sofa. When you’re watching TV or reading a book, you won’t mind that the sofa faces a wall (while you stretch out and appreciate the extra lounging space), and when simply passing through, you will notice that the space looks extra long. Go with the colour flowHooked on a rich shade, such as purple? 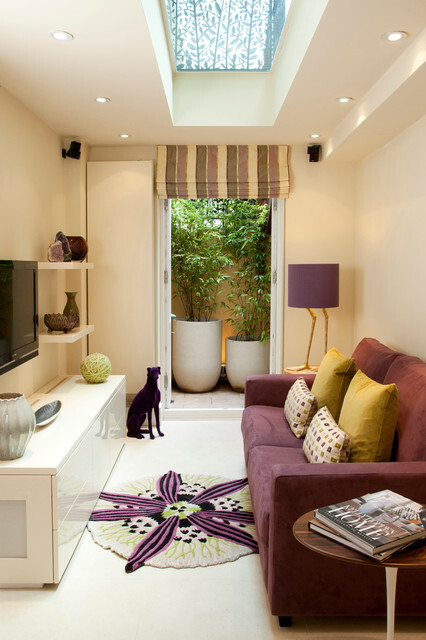 No problem – if you go for a faux pet, it can be totally coordinated with your scheme. And if you update with a brighter pastel, not a problem – just check which other shades your furry statuette comes in first. Frame a doorway…Create the impression of a tropical paradise outside a doorway by placing large potted plants just beyond the frame. The result: a tantalising glimpse of foliage, even if the door only leads to your hall, bathroom or a narrow outdoor space.